In this day and age, diversity is everywhere. People of different races, religions, genders, sexual orientation and abilities live in close proximity. Many parts of the world including the United States have become a true “melting pot” in most cities. It is high time that we learn to live together as respectful human beings. That is where tolerance begins. Children these days are a bit more enlightened than probably their parents were. That might be due to the fact that information in abundance is right at their fingertips through the internet. Anything they want to know can be found out with a bit of digging. That knowledge helps kids to accept each other with wonder instead of suspicion and fear. Fear has been the beginning of much intolerance and bigotry throughout the world. Parents are the first models for kids. When they see you acting suspicious around people of other cultures or making unfounded assumptions about them, it teaches them to act the same way. Discover where your feelings about certain cultures come from and, if necessary, seek to make a change that reflects a more compassionate attitude. When kids are learning about other cultures and religions in school, participate so that you can learn something as well. It shows your child that you care about others. Each person in your family is unique. Celebrate that by not comparing them to each other as one being better. Even if it doesn’t involve your family, teach your kids not to accept intolerance and to point it out as unjust. This includes racial slurs, distasteful jokes, social stereotypes about groups of people and unfair practices. I find your choice of tolerance as opposed to acceptance interesting and refreshing. While I tend to be a very accepting person I respect that not everyone will like others choices. Just because you don’t like or agree doesn’t mean you can’t be tolerant. Exactly Sarah, just because they don’t like something doesn’t mean the other person should feel ashamed just because they feel differently. I love your idea about fostering an attitude of charity at home, celebrating each person’s uniqueness rather than comparing. Thank you Nicole, I truly believe it, I’m always showing my boys how that it is wrong to treat people different. I remember once when my girls were young, were in line at the post office. Two children inched away from their parents and began to play with each other. One was caucasian and the other filipino. The caucasian parent quickly pulled their child away saying. NO! don’t play with him. Each time he tried to steel away the parent pulled him back, even asking the mom of the little boy to keep her son away. In a very stern voice I might add. I used that as an opportunity to teach my daughters a lesson. Not only did they call the boy over to talk to him but we discussed what happened with the other child when we returned to our car. Good article. Much needed even today. That is awesome to hear Elena, it’s hard to see when parents act like that, hopefully when the boy grows up he will learn how NOT to act! Great tips! We work on being kind, and not having to be right. My children are very compassionate, and are quick to stand up for others and include new friends. I love the fact that they don’t judge. Absolutely Princess! Thank you for stopping by. Such an important message you wrote about. 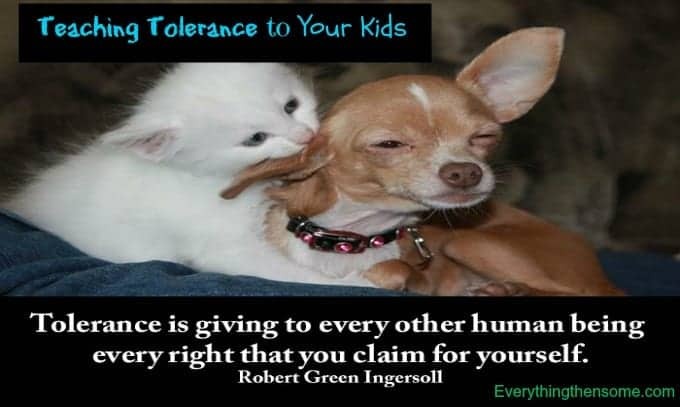 Tolerance starts at home… and not just about race, but about religion, political views, etc. I grew up in a place where, as a white girl, I was the minority among many other ethnicities more prevalent than mine. It was a culture where I learned tolerance which led to teaching my children to be ‘color blind’ as best I could. Keep up the message! Those kids in Oklahoma sure needed a lesson or two! Your right, Tolerance does start at home. I think everyone should be “color blind”, then it would never become a race issue, then maybe they would all just get along. But I suppose that’s asking too much. Thank you for stopping by Carla. This is such an important issue that should be taught to our children at a very early age. Giving our children the gift of tolerance and curiosity to learn about new places and people is one of the greatest gifts that we can give to our children. I really enjoyed reading this post! Rena McDaniel recently posted…#BAMC15 …The Amazing Time I Had! I’m glad you enjoyed reading it Rena. And I agree it does need to be taught at an early age. This is such an important subject! I appreciate your distinction between tolerance and acceptance. I think so many of our cultural dilemmas stem from the lack of tolerance. I not only teach tolerance to my children, but I also remind myself to practice what I preach. As adults we’re often unaware of the ways we pass down our experiences and insights to our children. We have to pay more attention to our words and actions, no matter how small or innocent they may seem. I truly appreciate this post! I grew up in a very small Southern town and now live in a big city that is quite the melting pot, so I have seen both extremes. As a mom to 9 year old son, teaching him about equality and tolerance is very important. As another commenter said, thanks for differentiating between tolerance and acceptance. I also really like that you pointed out getting involved in cultural activities as a way to promote tolerance. We have many of those opportunities where I live and your tip gave me a whole new perspective. I’m glad I could help Julie! I live in a big city as well and I see all kinds of different races, it’s so nice to be diverse. Kids love learning and I can’t think of anything more interesting than learning about other cultures. Growing up in NYC, diversity was everywhere. I love your point about “pointing out inequality” to our kids. They need to know what is not acceptable, regardless if the statements are nothing about them. This is great insight. I was concerned about this when we moved from a blended military community to an area where most people look just like us. One day my three-year-old got really excited and exclaimed to a man at the store, “Wow! You have brown skin!” The man smiled back and said, “Yes, I do!” It was really cute. I love that you wrote about this subject! It very much goes along with the topic of compassion which I have been writing about lately! I hope that through our writing we can help get more people in this world to be accepting about others and more compassionate towards everyone! In my classes I took to get certified to teach elementary school they talk about teaching about diversity a lot! They give us so many tips and great ways to teach this to the kids, I think it is wonderful! Thank you for your post! Amy Lou recently posted…DUDE. Be Nice. I’ve never thought about those two things in those terms. Typically, we teach kindness, celebrating the fact that we aren’t the same, the difference between being someone’s friend and their acquaintance (my son is starting to make not so great friends). Good reminder. Interesting post. I certainly agree that it starts with the parents. This is a topic we can really shape our kids with. We live in a rural small town without much diversity. We made the point to discuss our views, why we feel that way and to expose them to a variety of settings/experiences . All three developed such compassion especially for the homeless and those on the fringes of society. I am proud of them as adults now. Good topic!! Can I just say how much I love this post and how fantastic I think you are! I grew up as a member of the LDS faith, in Tennessee, surrounded by people of all faiths, cultures, skin colors, etc. My mom took us to every type of religious meeting we were invited to or wanted more information on. She took us to Synagogue, Mass, Baptist, (sorry if these are not the appropriate terms) you name it we went. Because of this I have met some incredible people and have a different way of looking at all of life. I do struggle with people that preach about love but are so intolerant and unloving themselves. All these religions teach love, everyone just wants and needs a little love. I’m not a “tree hug-er world peace love solves all problems” type of gal (I’m a military wife after all) but I just think there needs to be so much more love and tolerance in the world. Not a disregard for our own beliefs but a tolerance that each person has an opinion and they have a right to it and we should love all. Granted there are extremists but that is a totally different rant for another day. I just seriously love this post so much! I know there is more to it than the religious example I gave so I’m sorry my comment it so long and only about that. I just love that there are other parents out there teaching their children these things, it wasn’t just my mom or me or a handful of people – it seems more and more are (by the looks of your comments). Thank you for bringing awareness to this! Katy recently posted…Registry for kid birthdays? The word tolerance has such a negative affect on people these days. In my family we teach kindness and respectfulness, basically the same thing. I think its very hard when you a of a certain faith to really dip deep and know how to do this. For our family, it comes down the the question of Love. We are Christian and God’s second greatest commandment is “to love others”. So we teach our children that whatever our personal beliefs are, everyone needs to be treated with love. I wish any people could see the world the way you do. Sometimes I think that ever tho I grow up in the 50s and 60s when things were less tolerant towards some people , the world is less tolerant today than then. Thank you for sharing this and I pray others who read it will take it to heart. We should all be teaching Tolerance to the young people around us. Have a Fabulous Day! Very right. We teach our children to treat everyone kindly, even if we don’t understand or don’t agree with their lifestyle. Thank you for bringing this topic to light. I loved your point about cultural exposure and I think travel is a another activity that can help in this area so much! The problem is that usually intolerance comes from fear, and fear is spread constantly in today’s media, from the terrorists are out to get us to the poor are scrounging off you. Until the media changes it’s story and promotes the positives rather than the negatives fear will out shine tolerance. You are right though you can start to fight intolerance by involving yourself in others communities but sadly it is not people like you or I that need to do this as much as the people who are intolerant, until they learn not to fear they will never learn intolerance. Good things to think about. Thank you so much for the ideas and suggestions. Good things to think on. Thanks so much for the ideas and suggestions. In my opinion parents opinion and their way of handling situations are the most important to show what tolerance means exatly for the kids. Jennifer, I love you blog post. More than ever, we need to invest in our children. With three boys, I definitely understand the power of influence. Parents always set the tone. I believe every person on this earth we born with a uniqueness. I like to say that we are all weird, which basically means we are different and supernatural. According to God, each hair on our head is different. Each of us bring something valuable to the table. Not one person that has been on this earth is the same. So, I say Dare to BE different! Just as Jesus, FEAR NOT, BE WEIRD! Discover your weirdness (http://www.mtnuniversal.com/weird-wednesday/). I don’t consider different skin color or other nations’ traditions any more different from how everybody has different hair or eye color, and I have taught my daughter to see it that way, too. However, I also make it very clear that there are things that are wrong no matter what origin you are, and this actions or behaviors should not be tolerated – abuse, cruelty, disrespect, indifference, etc. I teach my children that we are not made perfect, but are perfectly made. Great points to think about. I have always approached every difference with Respect, and learning opportunity for all involved. Thank you for these suggestions. Dawn Pratt recently posted…Save 10% on your DNA Order!!! We all need to be more tolerant of people. Emotions guide a lot of our actions. We can agree to disagree about how people act or react. Darlena recently posted…What Kind of example are you? I totally agree that teaching tolerance begins at home. More than just by words, tolerance is learned by observing the actions of those our children are around most and respect. By teaching tolerance we create better, wiser, kinder human beings. Thank you for sharing these tips. I value them. Sharing and pining them too! Great post, thanks for sharing! Thanks to the internet and social media, the world is a much smaller place and it’s so important our kids learn at an early age how to navigate in a space with so many diverse people and personalities. Love your tips! Thanks so much for sharing. My 4 year old had an unfortunate event recently that was a result of intolerance. It ruffled my feathers a bit, but my husband and I used it as a teachable moment for both my kids. I can do my part by raising respectful citizens and you just shared some pointers to do it the right way! Awesome. Teaching our children to be tolerant is the best way to decrease the bullying and racism. I hate that it’s even an issue still! If we teach our children to be kind by being good role models, maybe they’ll spread the love and share it with the world. great post! Each person is special. We need to learn to treat all with kindness. My little one just turned 4 and I love that she has no idea what the differences are in people with regards to skin color, yet, is learning the differences in cultures as far as practices, beliefs, etc. We try to teach her tolerance by being the best models we can be for her. It helps that we are visible minorities ourselves, so we can start with some of the significant differences at home. I love how her preschool encourages all the kids to be open to learning about other cultures through dance, crafts, music, and food. It’s beautiful how our world is becoming more and more open and understanding with others. I remember as a child, I was seen as different and kids were hesitant to be my friend because I didn’t physically blend in with their cliques. I remember working harder than most kids to be accepted. Luckily, my parents taught me persistence so I just kept working my buns off and found other ways to be accepted and respected. I became the student body president. Since then – I’ve been able to work through intolerance of others, and in fact, it’s becoming less and less apparent in “my own world”, and it gives me so much relief as a mom. I think that the word tolerance turns people off many times because its been over used in media (well the opposite of it ~ intolerance has been) as the “cause” for hate & disrespect. I think it is so very important, as you pointed out, to teach our children that every human being has been created by God, in His image, and therefore deserves respect even if they look different, make different choices than we do, or believe differently about certain topics than us. Thanks for the post! Melissa recently posted…New Year’s Resolutions? No Thank You! Exactly Melissa! Everyone does need to remember we were created in God’s image. He made us different therefore we should embrace it. Thank you for stopping by. I totally agree that everything starts at the home, and need to be aware of how we act (or what we watch) around our kids. Thank you for the reminder! Thank you for stopping by Cheryl and your welcome! Tolerance is a huge deal now days. My wife and I are very open parents. We hope that by showing tolerance and treating people with deserved respect we’ll set an example for our daughters. That is so good to hear Aaron, some parents just don’t care, and that’s what’s wrong right now. Thank you for stopping by! Great post! I loved the part about experiencing different cultures. I don’t have kids yet, but I myself can make the effort to learn and then pass on what I have learned later. Thank you Kimberley, I’m glad you liked it, hope you come back for more. What a beautiful message! Tolerance is definitely important for kids to learn and understand, especially when they reach school age and begin interacting with the diverse group of children and adults you find in a school environment. Mary from YourDesignerDog recently posted…Happy St. Patrick’s Day 2015! Thank you Mary for stopping by, I’m glad you liked it. I love this. I’m a nanny and have dealt with all types of children…and parents. This is definitely an important subject that needs awareness. I like how you said to examine our own feelings. Children really do watch everything that we do. Thanks so much for this, and I look forward to reading more of your posts! Thank you Stephanie, I’m glad you liked it. I know my boys sure watch everything I do, if I slip up and say a bad word they always seem to be around at that moment. Ugh. Great post!!! 6 years ago we moved to a very diverse area…it took some getting used to! But I’m so thankful that my boys are growing up with friends that are so different from them. It truly is a blessing. Thank you Melissa, I’m glad that we are all different, if we were all the same, I believe it would be pretty boring.